On 2nd January we left Kep in Cambodia to start our Vietnam adventure: I can't say if it's the contrast between the two countries or if Vietnam is truly magical by itself. But few hours after crossing to Vietnamese territory, things started to feel very bright for us! The bus we took from Kep to the Vietnamese border picked us up almost an hour late, and the time we wasted in the border was absolutely chaotic. There were no toilets in the security control, so once we made it to the Vietnam side, there was quite the queue in the dusty café to use them. Fun thing though, there were no toilets in there, just a half protected corner where to pee in the bushes. 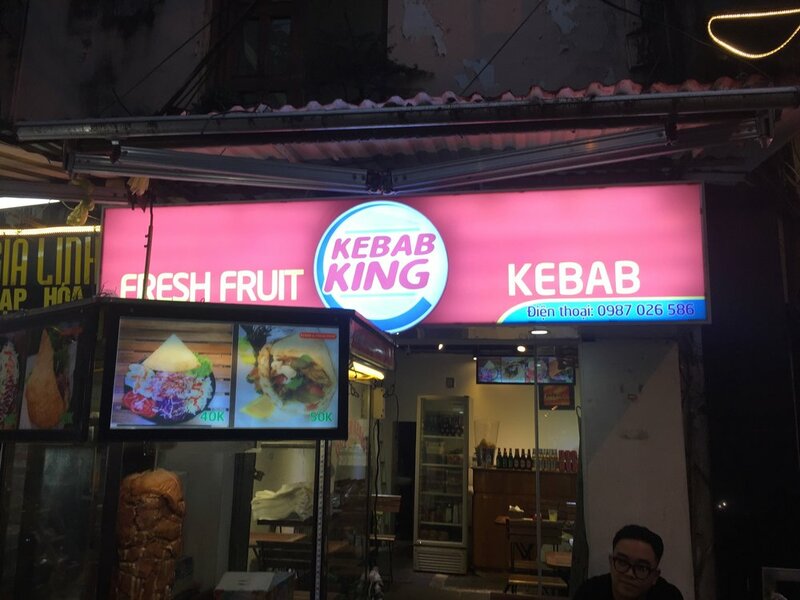 Welcome to Vietnam, I thought, and somehow I started to expect the worst. But that was really just a confusing first impression. We hopped on the bus that was taking us to Can Tho, a growing city in the Mekong delta, and the best thing that could happen to us did happen: we shared the back seats with another couple on the road - Andrina and Micha, the creators of Postcards for your kitchen. Their blog (in German) covers healthy and easy to do recipes, Italian wonders and of course their trip around the world. We hit it off pretty fast, since they are traveling without end date, had been already to Latin America and are big foodies. They showed us some of the videos they did in the Galapagos and Panamá - after watching them, we were in awe. 7 hours passed on the bus and we kept talking and talking, only to realise at some point that we were staying in the very same guest house, same type of room for 8$ the night in total. So after we dropped our bags in our rooms, we took the streets with one mission: to find the best Pho in town! We succeeded pretty quickly: we found a delicious vegetarian place that served the cheapest Pho and fresh rolls - the perfect way to start our Vietnam time! We spent the whole next day eating: we had a duck hot pot, all types of milk teas and coffees, and tried everything we could in the street food carts in the Can Tho night market. We even had durian ice cream, but we draw the line with the pizza with sausages in the edge... very Italian, the Vietnamese say! On Wednesday we decided to go for a trip to 2 different floating markets near Can Tho for 8$ which started at 5am in the morning. While not as colorful as I expected it, the market was a great opportunity to see Vietnamese at their best: being very loud, cheerful and scoring deals. We visited a rice noodles factory, walked along the canal, appreciated quite some fruit trees, were amazed with the bamboo bridges for the neighbours to cross to the other side of the canal, visited rice and watermelon fields and had a poor meal for lunch. Basically the only lousy food we had in two weeks in Vietnam! We returned back to Can Tho by midday and after a little siesta, we went for our favorite vegetarian Pho to forget about our lunch. Then we ended up having a fruit juice in a café ran by Vietnamese students, who in that evening were having an English exchange event. That's quite puzzling at start in Vietnam: in restaurants, hotels, in street stalls, you can meet a grandma who speaks great English and later on a teenager who cannot say a word. In this case, our hosts were all speaking very good English and they made sure to give us all the information we needed to make our Vietnam stay great. Next morning we had to say goodbye to Andrina and Micha - they were spending a month in Vietnam and we had only the free 15 days tourist visa. And that is probably one of the biggest mistakes we've done in this trip: Vietnam is worth all your time and while it's absolutely doable to visit the main interesting points in 2 weeks, it's a shame to rush in a country made to slowly enjoy every meal and new spot. We took an amazing bus from Can Tho to Saigon, now Ho Chi Minh City (HCMC) - again with a dangerous driver, but way too comfortable for the 4$ we paid for the trip. The bus company is called FUTA and they even have their own huge bus stops in excellent condition. In Saigon, we picked a taxi driver who couldn't really understand Google Maps - and because he couldn't lose face, he had as half an hour driving in circles until we convinced him to call our guest house. It turns out we were staying in the middle of the backpackers street in District 1. Sort of a Khao San Road, but with a swarm of motorbikes to make it just a bit crazier. Our host lady was waiting for us when we arrived and thank God - she took us to a labyrinth of little streets until we reached the door of the guest house. A double room with aircon for 14$, that compared to Can Tho's 8$ felt expensive, but for Saigon it was just perfect. 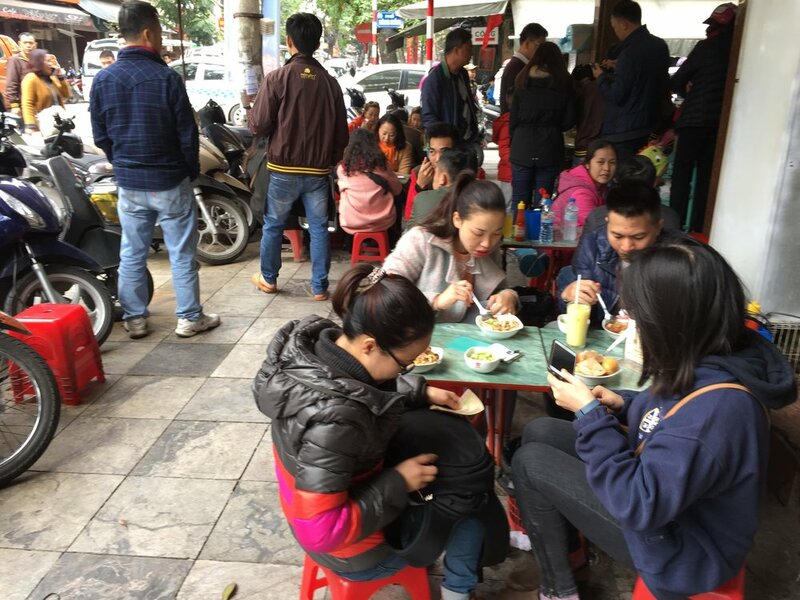 We ate pretty well in our street: Tran Hung Dao (aka the Vietnamese general who defeated the Mongol hordes of Kublai Khan) is full of cafés and restaurants catering backpackers and more conventional tourists. The prices can go from incredibly cheap to abusive, depending mostly on how westernised the venue is. We loved to sit down for Vietnamese coffee and get a complimentary glass of Vietnames tea while devouring our breakfast Báhn Mì. We found the best one in a little alley: omelette, veggies and mild chilly sauce... yummm! The streets of Saigon are exactly what you've seen in videos: in order to cross them, you should close your eyes and step slowly. You won't die, even if your eyes are telling you that you will. After a couple of days, the tension goes down and at some point, you become a disrespectful jay-walker with nerves of steel. A magic moment for me came always at sunset, when rush hour starts. An army of motorcycles take the streets and it looks like speedy ants going in all directions. 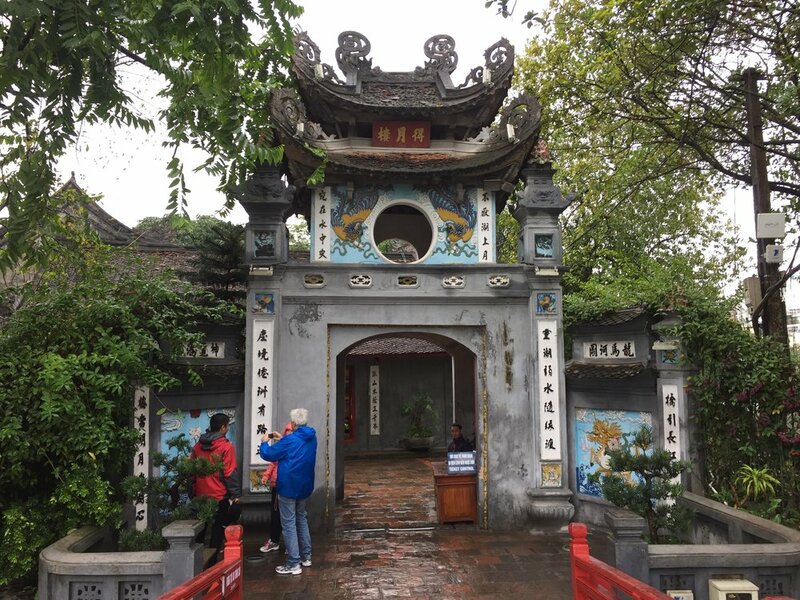 As stressful as the traffic in Ho Chi Minh can be, there's always a way to find green spots: a great example was the Tao Dan park, where for a minute you can forget that you are irrelevant if you choose to walk around in this city instead of driving a motorbike. We wanted to visit the Reunification Palace exhibition but unfortunately for us there was an official event held inside that day, so we could only see it from the outside. We decided to walk around the Notre Dame Basilica instead and soon enough we discovered the beautiful Saigon Central Post Office, which was designed by the studio of Gustav Eiffel. To complete the day, we visited the War Remnants museum: we were drawn inside by the impressive war machinery in the outdoor garden, but we stayed over 2 hours there because of the exhibition inside. I would name it the Museum where I had the hardest time to go through in my life so far. I haven't been in many Holocaust exhibitions, but after Tuol Sleng in Cambodia, this was a test to what mentally one can take about human atrocities. On one side, I did learn a lot, since much of what I knew about the Vietnam war came from the movies. 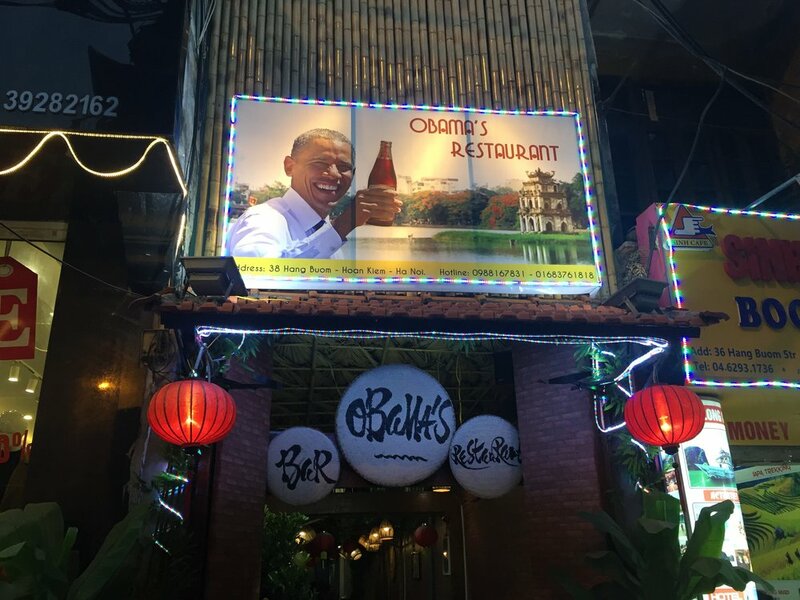 On the other side, it's hard to understand how Vietnamese can still smile after all they went through a couple of generations ago, and how the relationship between Vietnam and the US could ever be reestablished. I have to say, though, that US Americans were at least 50% of the guests visiting the museum on that day and from their faces you could see that they were also having an eye-opening moment and it was even harder for them to read and see the information in the exhibition. The Agent Orange room is probably the worst part, together with the room in homage of war photographers who covered the conflict. After a mentally exhausting early afternoon, we kept discovering the city. One of the things that caught my eye in HCMC is how very small and humble businesses keep up next to huge malls and skyscrapers in the city center. That and the incredible number of cafés a city can have: every 3 shops, 2 are coffee shops in Saigon! Soon enough we realised we needed to speed up if we wanted to make it to Hanoi in 10 days. So we decided to take a flight from Saigon to Dong Hoi for 36$. The train was another option, but the ride from Saigon to Ninh Binh was going to take us 34 hours and we didn't dare. Dong Hoi turned to be a pretty boring and deserted coastal town and nobody in our hostel spoke any word of English. Which would have been absolutely ok if the door of our room had a lock, but it didn't. A call to booking.com fixed things in a few minutes, which always amazes me. I consider them one of the best companies worldwide in terms of customer support speed and efficiency. The fix was bizarre though: we switched rooms with the staff, since their room had a lock 😂. We tried hard to find out where the people of Dong Hoi were hiding but there was no luck: we only found plenty of motorbike shops with the latest models, but empty of customers as well. Finally we decided to chase the tourists and we entered a backpackers hostel full of them. There an amazing lady who spoke perfect British English and is a big fan of CRO told us that everyone was at the city fair for the weekend and that the train next morning would be our best choice to reach Ninh Binh. We had planned to stay 2 nights in Dong Hoi but it didn't make much sense. So we hopped on the train for a full day: it was impossible to sit where our 15€ ticket said we should, but all in all the train experience was fine. Not as comfortable as the buses we had used before, but the other passengers were very nice, shared their food with us every time we casually glimpsed out of curiosity, and actually the train offers meal service similar to the one in planes for around 35.000 VND, which is approximately 1,5€. At some point during the train ride we realised we were on the exact same train that had departed Saigon on the day we left by plane. We had decided against it in Saigon, but there we were, sitting on that train, enjoying ourselves a lot. We could see from our windows how the railroad crossed hundreds of small towns with big churches, surrounded by rice fields. We left behind the towns where the hard labor was done with the help of buffalos and slowly in the north the first tractors started to appear. One can still travel in time when crossing Vietnam. The train station in Ninh Binh was unremarkable, but we were shocked about how cold and humid it was. We reached our hotel in Tam Coc where our super sweet host awaited us and as soon as we entered the room we knew it was going to be a cold and humid stay indeed. We went for a Pho before going to sleep, which we had by the lantern light, since minutes after getting our bowls there was an electricity blackout in the town. Call it town, call it a street full of homestays, cafés, restaurants and small shops facing the Tam Coc pier. Reader's note: Ninh Binh will always stay in my mind as the place where I finished reading "Anna Karenina". 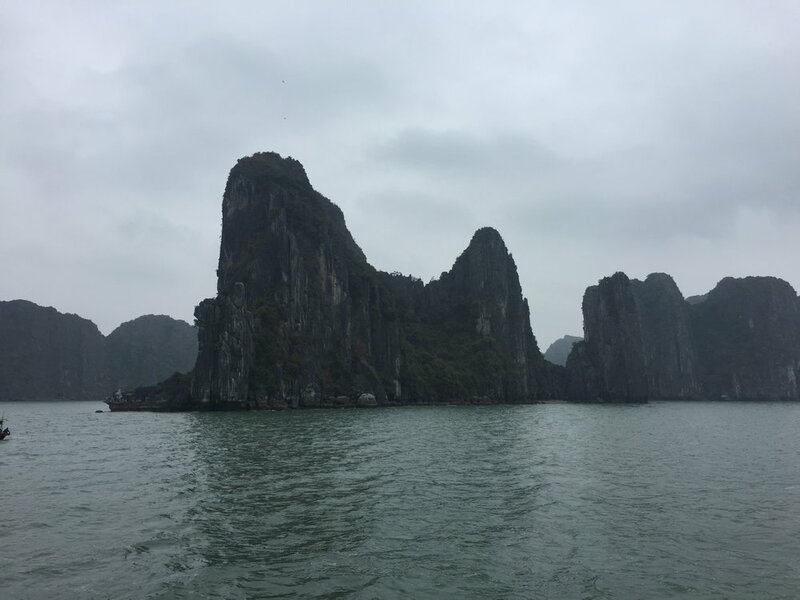 Next morning we got in the boat for the Tam Coc tour and instead of being greeted by the intense green in the limestones and rice fields, the grey sky turned our long awaited picture in dark green huge limestones surrounded by brown water. We didn't choose the best time to visit Tam Coc, since the rice fields were still not grown enough, and to top it up, in the middle of the boat tour it started raining. The upside though was having an unobstructed view to the landscape as there were very few boats on the water that day. I absolutely enjoyed entering the dark caves travessing the stones - there seems to be no way out until the boat takes a turn and suddenly you can see the light on the other side. The tour costs 120.000 VND for each of us to enter the park and 150.000 VND to rent the boat with the driver, who if is a woman, will row with her legs. In total, it was 195.000 VND per person, and that's around 8€ for 2 hours. Which is absolutely ok in my opinion, but got a bit spoilt when we saw the tricks used to make it more expensive: when leaving the pier, a photographer takes a picture of you from the other shore and demands payment when you return; at the point where the boat turns around there are ladies in boats pushing you to buy stuff to your driver, and your driver will not take a tip that is less than 50.000 VND. But after Cambodia, my anti-rip-off muscle is well trained and I handled it like a boss: when I spotted the photographer, I turned around and covered my face; when turning around I urged the driver to go back to the last cave to shield us from the rain, and when the driver refused the tip for being too low, I didn't feel bad to keep the tip after she refused it for the 3rd time. We spent the rest of the afternoon in the hotel, because it never stopped raining. 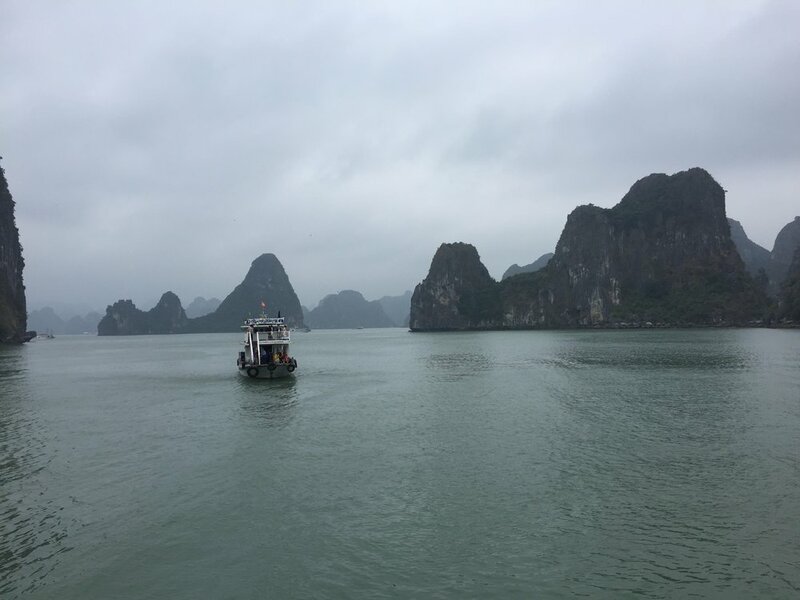 For the next day, we decided to book a tour for one day only in Ha Long Bay for 35$: the weather forecast was awful and there was no point in staying longer. 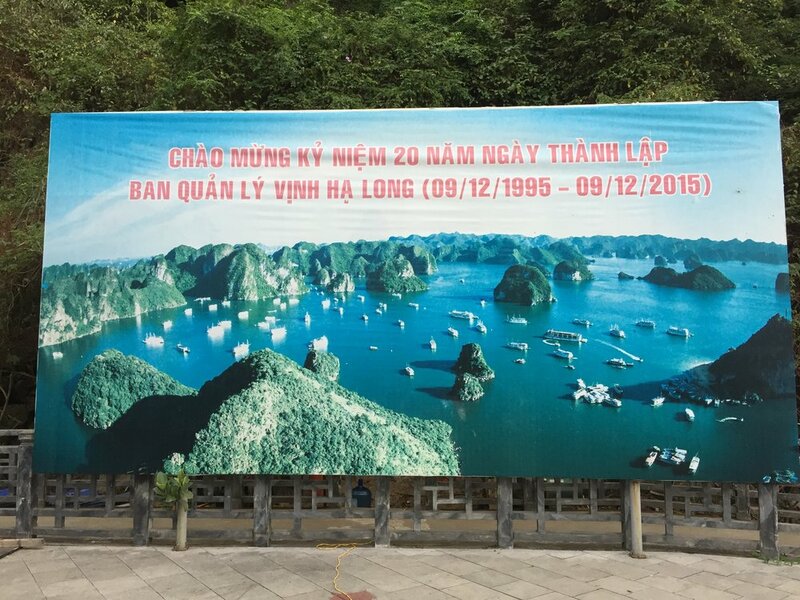 Plus, the tour could drop us in Hanoi on the way back, so we would save quite some time. We definitely didn't think too much about going north in Vietnam, forgetting that the weather changes from south to north and we were traveling in January. And still, rain and cold and all, Vietnam captivated us. After exploring the limestone rocks, we took a look into the Dau Go Cave, which as part of the pack was actually pretty awesome to see. There were no queues when we got there, but again, it was a rainy day. 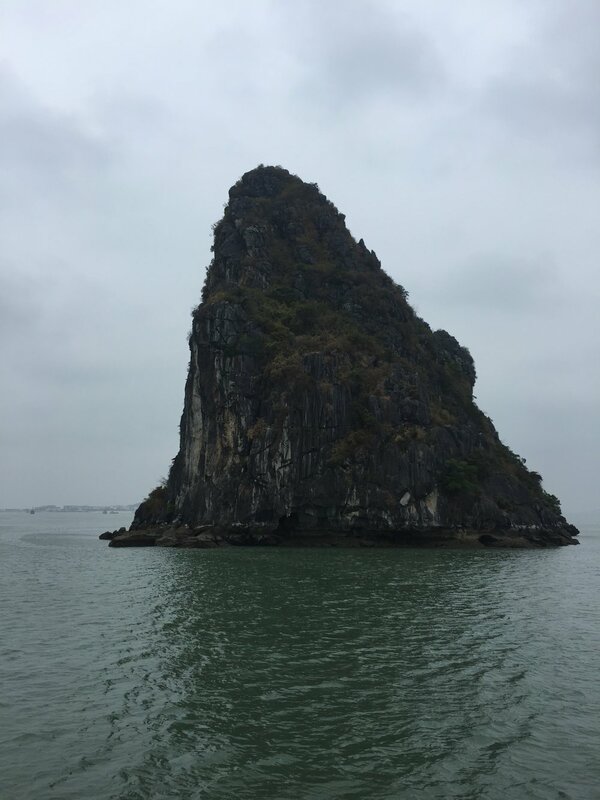 If you plan to go to Ha Long Bay and you need help deciding when and how long to stay, this is an awesome guide. And if you need more, TravelFish has, in my opinion, the best guide online for Vietnam. And for food guide, then ALWAYS, ALWAYS check what Mark Wiens has to say! Right after we finished visiting the cave we headed back: our bus to Hanoi was waiting for us! We arrived at our guesthouse at around 23h, so there was no time for exploring. It rained for 3 days straight in Hanoi and we only dared to go outside on day 2: we were exhausted from our previous days spent in buses, so we took it easy. Luckily on the 3rd day, Hanoi started to go back to normal: the previously almost empty streets filled in with motorbikes and we found THE Bánh Mì to rule them all. 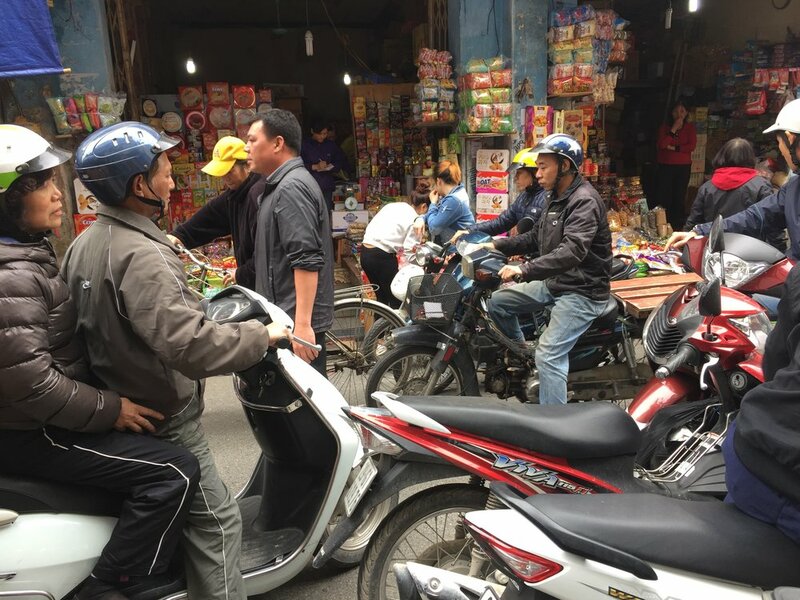 When doing my research about what to visit in Hanoi, I stumbled upon this blog post about doing absolutely nothing in Hanoi and I couldn't agree more: there's not much to see in the city, yet Hanoi is full of daily life discoveries. There are the gloves fixed on a motorbike, which is absolutely genius; the guy doing FaceTime with his phone while driving his motorbike, the British backpacker conquering the crowd by the lake singing "Hello", the father teaching his baby son how to honk while on the motorbike, the shop signs including phone number to add on messaging apps, the Facebook AND Instagram usernames; the love for the Döner Kebap, the Obama restaurants, the people queueing on top of their motorbikes at their favourite street food stall without caring a tiny bit about creating the worst traffic jam ever, the übercute babies (and you know I'm no baby lover), the Bia Hoi beer for 25 cents, the perfectly counterfeited bags and winter apparel (Superdry, The North Face, Fjällräven, you name it), the giant screen canvases appearing out of nowhere on street walls when there's a football match. Endless. 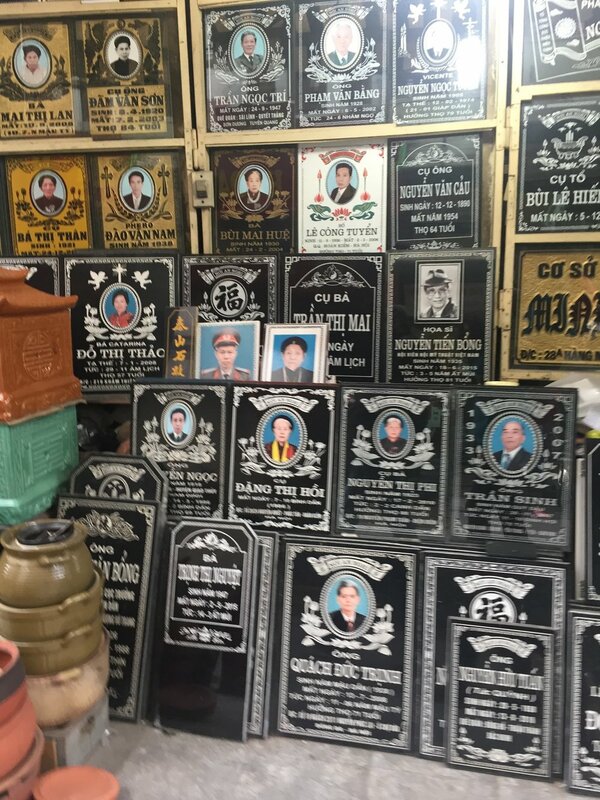 Of course we visited the Ho Chi Minh Mausoleum and the beautiful Hoa Kiem Lake and Den Ngoc Son temple; and the pretty West lake, including the nearby Chua Tran Quoc pagoda, and the Dong Xuan Market, but mostly we were in the Old Quartier just having egg and coconut coffees, letting Hanoi entertain us. And as you can see by the quantity of pictures, it was non-stop fun to watch. We spent 5 days in Hanoi in probably the smallest room we've stayed at so far, with no windows, but comfortable enough. We watched all of "Silicon Valley" and worked in our passion projects. A big drama arose when we realized the Tolino was missing 😭😭😭 - time for carrying heavy books around again! We certainly took Hanoi easy: lots of Pho, Bánh Mì and walking around. We wished we had been able to take Vietnam even slowlier! We hope to be back soon enough and explore the central area, visit Hoi An, the Sapa region, enjoy a sunny and hot summer in Ha Long Bay, eat even more Vietnames dishes. Vietnam is such a diverse country in terms of landscape, things to do and to eat that a 2-week visit is simply not enough. There's truly no limit of Pho we can eat and dream about eating! On Monday 16th January our visa was expiring, so on Sunday we took a 20-hours VIP bus ride to Vientiane, Laos. And when I say VIP, I half mean it!